Being able to fish everyday, is every angler's ultimate fantasy. Many Vancouver residents have actually been able to achieve this ultimate dream. Lulu Island is surrounded by water, the Fraser River branches off into many small systems in this region, resulting in numerous fishing spots. Commuters speed by North Arm during the morning and evening commutes, yet this stretch has been relatively unknown or underrated by anglers. North Arm is bounded between Queensborough Bridge and Knight Street Bridge. Its south shoreline is lined by River Road in Richmond, which can be accessed either from No. 6 Road or Westminster Highway. Access from the north side of the river is limited. The only good access is at Burnaby Fraser Foreshore Park. North Arm can be fished year round. It may not be as productive as popular streams or sloughs in the Fraser Valley, but nine out of ten times it will produce. More importantly, it is close to home and access is easy. Unlike South Arm, which is a large deep channel that allows huge cargo ships passing by, North Arm is relatively shallow and narrow, resulting in calm water even during tide changes. Summer fishing for coarse fish and white sturgeon is good at any given time. Bull trout and cutthroat trout predate in this area during spring. As long as water clarity is reasonable, spincasting for them can be done. Fall months, depending on opening time, salmon fishing can be good during the incoming tide. After a hard working day in a busy environment, North Arm is the perfect place to spend some relaxing time by doing a few casts without the distraction of speeding boats or large angling crowd. The amount of fishing space is endless, you can fish along the entire river where it is not privately owned. 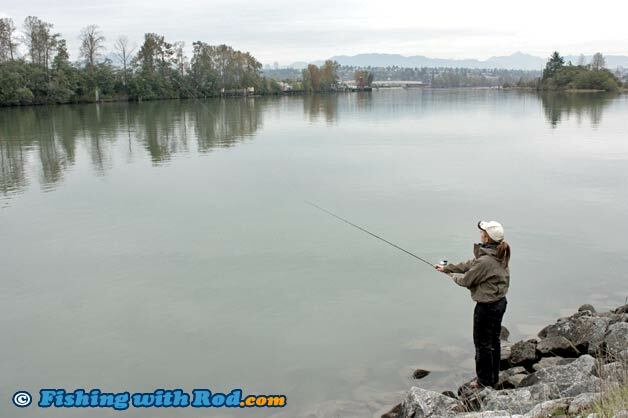 Walk along the shoreline with an light spinning rod that is rigged up with a spoon or spinner is a good option. Fishing is unpredictable, you may encounter fish in all sizes, from large tyee to small peamouth chub. Bull trout and dolly varden are abundant in spring and fall. They come in all sizes, from one pound to ten pounds. These hungry chars are always eager to attack your lures. If regulation permits, this stretch of river is an ideal place for barfishing during fall months. Thousands of coho, chinook and chum salmon pass by the shallow water each day. With a bit of patience and some well cured roe, it is not unusual to hook into some very nice salmon when the timing is right. North Arm is located in Fisheries and Oceans Canada's Area 29. Please read the general tidal fishing regulations and Area 29's regulations. The salmon fishing openings are usually announced during the season, so it is always best to check for opening times and other restrictions before heading out.